Having featured a few fearsome fish in recent Issues, Fishpool felt it only right to make mention of one of the most famously toothy predators in the sea. The great barracuda (Sphyraena barracuda) is one of 28 species of the Sphyraena genus and is the largest and most revered. They are found in the subtropical waters of the Pacific, Indian and Atlantic Oceans, where they grow in excess of six feet in length and 100 pounds in weight. They are similar in appearance to the freshwater pike (Esox Lucius) with long, streamlined bodies and powerful late set fins and tail that are used to torpedo into prey. Like the pike, the barracuda is an ambush predator that is largely solitary. It will spend hours lying motionless before a nearby movement or opportunity triggers an instant response – it can reach speeds approaching 30 mph as it springs an attack. 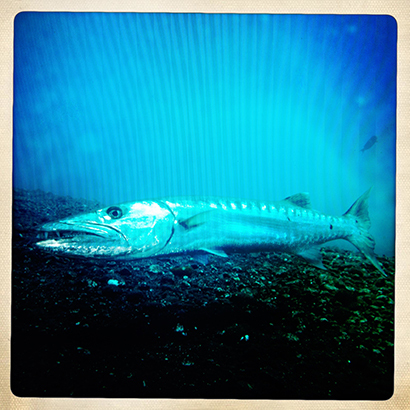 The barracuda has long been feared and is often painted as a threat to Man. In reality however, any aggressive interaction with people is likely caused by curiosity or panic, and genuine attacks are rarely recorded.